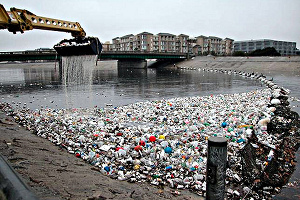 Trash in the Los Angeles River, en route to the ocean. Photo: kqedquest. Plastic bottles, aluminum cans, plastic knives and forks, tangled fishing line, plastic bags, food wrappers, cigarette butts… all this and more will be collected from California’s beaches this coming Saturday, September 25, on Coastal Cleanup Day. On last year’s Coastal Cleanup Day, volunteers collected over 1.4 million pounds of trash from California’s beaches and waterways. That is a mind-blowing amount of trash! All this trash has a devastating effect on ocean life. Sea turtles eat plastic bags, mistaking them for jellyfish. Marine mammals get tangled in abandoned fishing nets. Sea birds are found with bellies full of colorful plastic shards. And, plastics can leach chemicals into ocean water. Bisphenol A, the chemical in hard plastic water bottles, has been found in seawater. Bisphenol A and other chemicals can mimic animals’ hormones and disturb their development. It can also bioaccumulate in fish and shellfish—and could potentially end up on our dinner plates. The trash that washes up on our beaches is only a tiny fraction of the debris in the ocean. Check out QUEST’s TV Story, Plastic in the Pacific, to get a sense of the Pacific Ocean Garbage Patch. This collection of trash, caught in a gyre in the middle of the Pacific Ocean, is perhaps twice the size of Texas. It isn’t just floating plastic water bottles—it’s also a soup of tiny, confetti-like fragments of plastics that have started to break down, but will never completely disappear. Coastal Cleanup Day is a great opportunity to clean up California’s coasts and prevent this trash from getting swept out to sea. It also sends a message: people care about minimizing the impact of trash on the environment. Last year, over 80,000 people volunteered on Coastal Cleanup Day. To find locations where you can volunteer this Saturday morning, look here. Ultimately, we need to decrease the amount of trash we produce. In Germany, a policy was put in place in 1991 that made manufacturers and stores responsible for recycling all the packaging material for the products they make and sell. Customers unwrapped their purchases at the checkout stand and left all the wrappers at the store. (My dad tried this at home in Virginia—it didn’t go over so well.) This forced German manufacturers and retailers to create a recycling program to deal with all the trash, and provided a strong incentive to reduce the amount of packaging they used in the first place. A few California cities are off to a good start with localized bans on plastic bags. Let’s come up with other ways to ensure that in the coming years, volunteers on Coastal Cleanup Day will have less work to do!